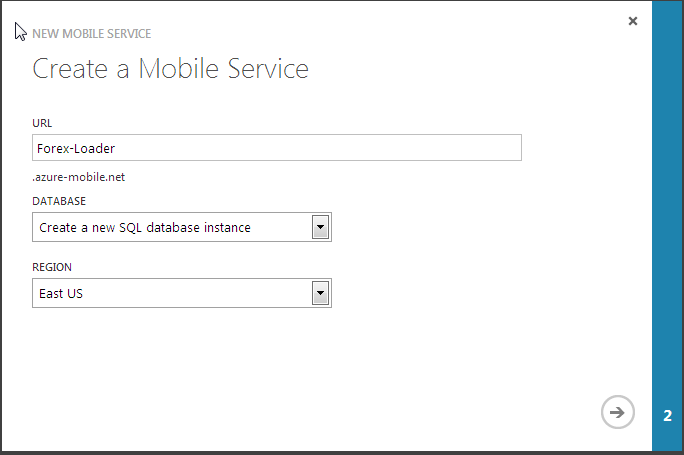 Before using the scheduler, you just need to know a little about Windows Azure Mobile Services. 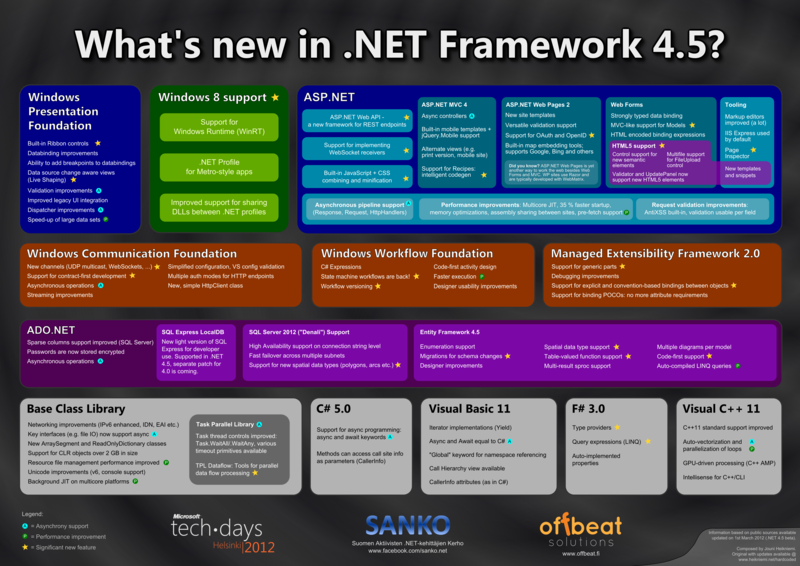 The below paragraph summarizes the features. Mobile Services on azure allows you to add structured storage, user authentication and push notifications to your Android, iOS, HTML, Windows Store, or Windows Phone 8 apps. Have a look at the below list of features. You can visit mobile services website if you are a beginner. 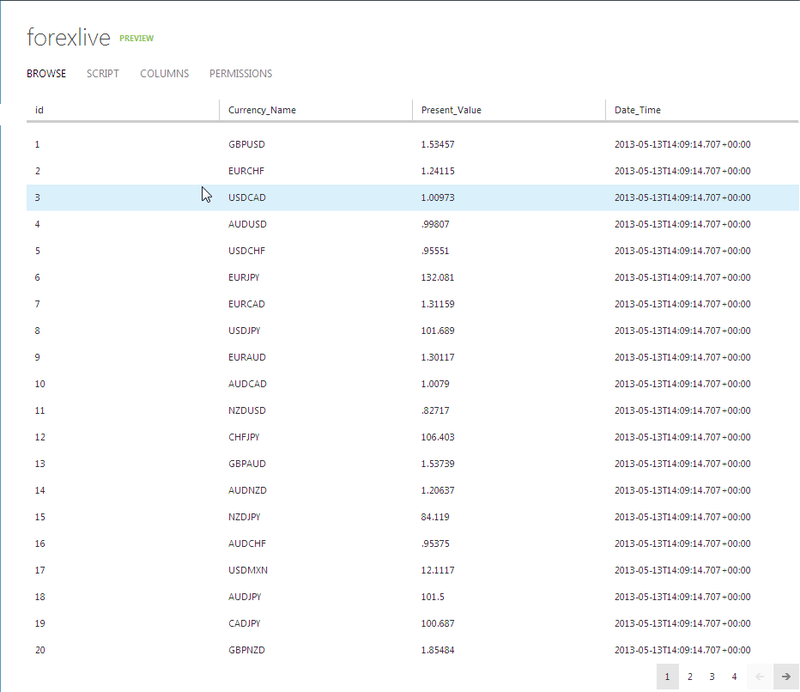 As a proof of concept, let us create a mobile services scheduler job on azure to get the live Forex data from an API and then load the data into a table recursively. (It simply means, every x minutes, our scheduler gets the fresh Forex currency data and stores it in a structured storage). The data we store can be used in a variety of ways later. 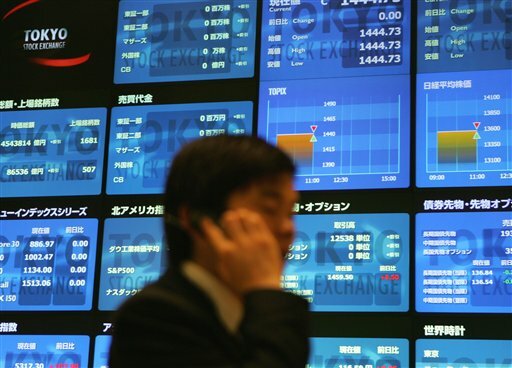 You can push the data to end user's mobile phones through push notifications or you may want to draw a currency chart on your users mobile phone screens. It is up-to you. Here we go. Login to Azure management portal, navigate to the mobile services tab. First, let us create a Mobile Service. Click on the "create a new mobile service" link (see above screen) and provide the details of your new mobile service (like in the screen below). go Next. 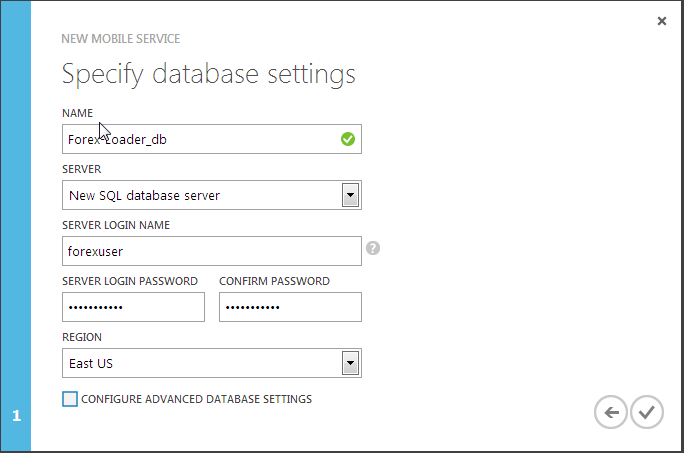 Specify the database settings like I have done below. Finish (Click on the check mark above). Wait for a few seconds. Your mobile service will be created and ready to use. You will the below screen. Click on the Forex-Loader mobile service (The arrow pointing towards right) in the above screen. Mobile Service screen will get displayed. 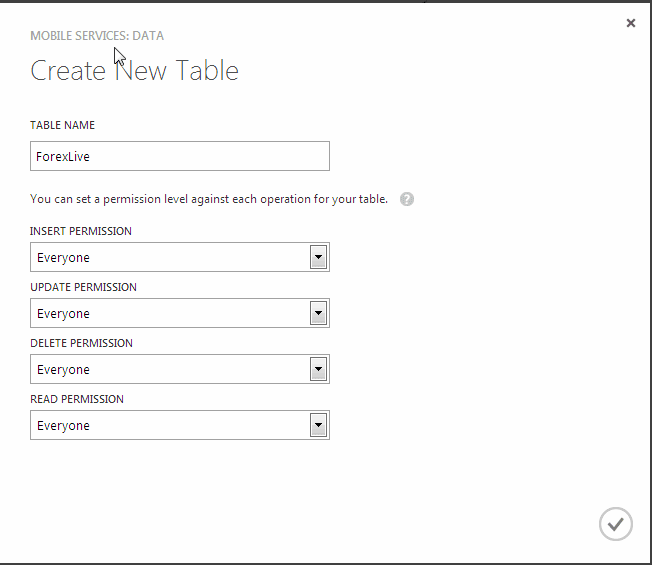 Click on the DATA tab to see the below screen to start creating a table. Once you click Finish (check mark) in the above screen, table will be created with a index and with no records automatically. See the below screen on how it looks. 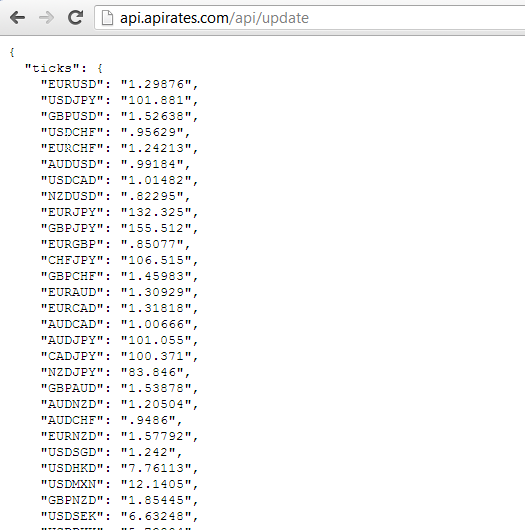 (Now, don't worry that you did not provide details of fields, datatypes etc. Azure will do the magic!. Fields are created automatically at the time of loading the data. You don't have to define it well in advance). Let us create a scheduler. Click on the Scheduler tab. You will see the below screen. 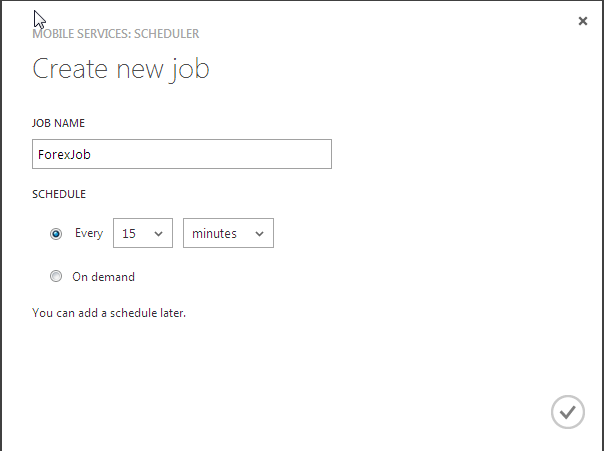 Click on the "Create a scheduled Job" link to create a new job. Provide the details as mentioned below and Finish. While creating a job, you may notice that you can schedule to run the jobs in different time frames in a variety of available combinations. You can select the option 'On demand', if you want to manually run the job. Let us now write some code to do the actual task. Click on the right arrow to open the ForexJob you just created. When the Forex job opens, by default it will take you to Configure tab. Now, you should navigate to the SCRIPT tab. You will see something like the below screen. Then the code, parses the JSON response and gets the individual currency pair values and loads it into an object and finally pushes the data (of every pair) into the table. (within a loop). 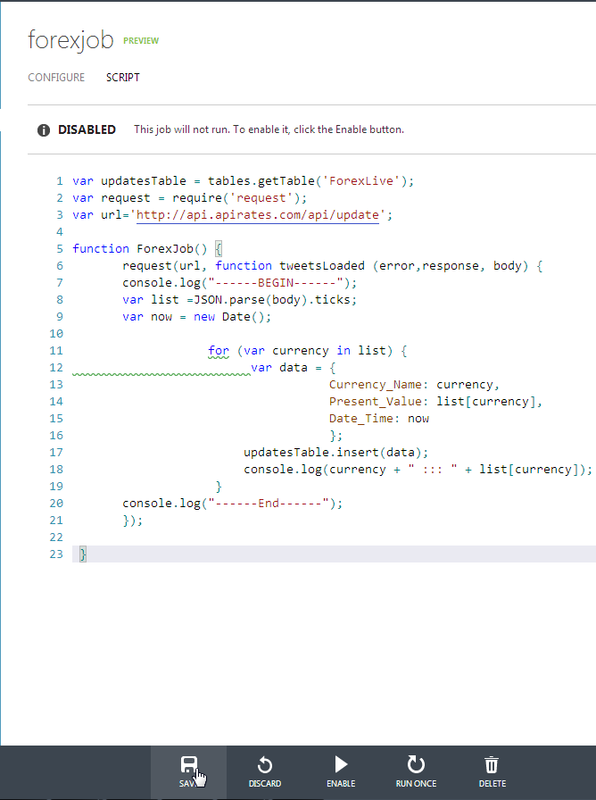 Below screen shows how it looks after you add the above code. Click on the save button (above screen) to save the Job. Before running the Job, It is very important to Enable it first. Click on the Enable button in the above screen. You are almost done with it. Now, if you do not want to wait for few minutes to see the job running, just click on the "RUN ONCE" button to forcefully run/test the job once. Congratulations. You just ran a new Job. Waiting to see the result?. Just click on the Back button as you see in the screen (below). Open the ForexLive table (Click on the Arrow pointing towards the right) and you will realize the Magic that has happened !! The scheduler has done its job and loaded fresh data to the table. Remember, this will happen every x minutes you selected earlier. Observe the Column Names of the table and the way it got created :). To your surprise, an Auto Ident column got created too! Use this data and do whatever you want, show it to users at run time, push it to phones, do analytics, come up with fresh charts or what not. Hopefully this post helped you to learn a thing about Windows Azure Mobile Services. NOTE : Delete the Mobile Service after doing this exercise. You will end up paying HUGE Bills otherwise as it silently runs in the background every now and then costing you.